Streaming services have had an impressive few years at the Golden Globes, and this year’s, held last night, showed that things are only getting better for the likes of Amazon and Netflix. The streamers took home a total of seven awards, two to Amazon and five for Netflix. On Amazon’s side, Ben Whishaw won best supporting actor for his role in historical drama A Very English Scandal, and Rachel Brosnahan won best actress for her starring role in The Marvelous Mrs. Maisel, an award she also picked up at last year’s Globes. Like last year, Mrs. Maisel was nominated for best comedy or musical TV series, but though it won last year, it lost this year to Netflix’s sitcom The Kominsky Method. The Kominsky Method about an aging actor’s friendship with his agent (Hollywood always loves a show about hollywood, picked up two of Netflix’s five Globes, winning the aforementioned best comedy/musical series award as well as a best comedy actor award for lead Michael Douglas. Netflix snagged a third award with Richard Madden, star of thriller The Bodyguard (produced by BBC and distributed by Netflix outside the U.K. and Ireland), who won best actor in a drama. Netflix’s final two Globes — best director and best foreign-language film — came from Roma, the Alfonso Cuaron-directed film that apparently finally convinced Netflix to switch up its distribution strategy. Prior to distributing Roma, Netflix held firm on its belief that films should be released in theaters and online simultaneously, a position that prompted a boycott for its critically lauded 2015 film Beasts of No Nation. But with Roma — as well as Bird Box and The Ballad of Buster Scruggs, two more awards-y films — Netflix scheduled limited theatrical releases. 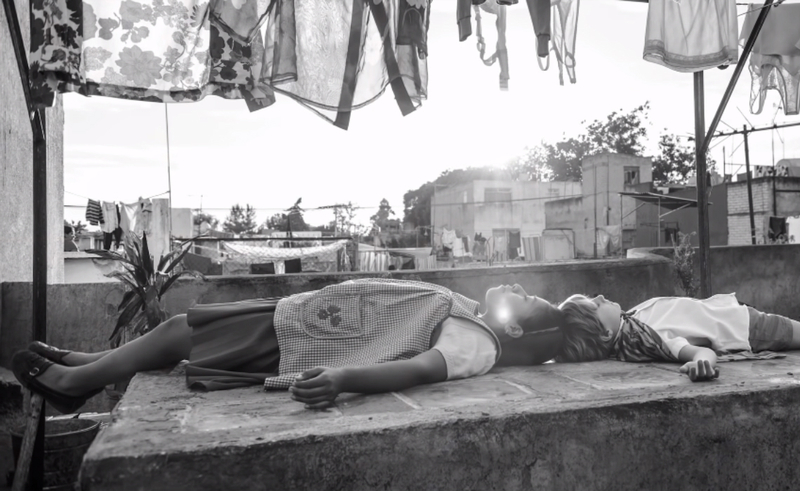 Roma‘s staggered, multicity release began Nov. 21 with independent theater chains like IFC, Landmark, and Alamo Drafthouse prior to the film’s SVOD release on Netflix Dec. 14. This move made the three films eligible for major awards shows that require theatrical releases, and also set a new precedent that could see Neflix bring in more Hollywood directors who want their films released in theaters — like Bourne franchise director Paul Greengrass, who allegedly is also pushing for theater distribution for his upcoming Netflix film 22 July. Noticeably absent from this year’s winner list was Hulu, which won two awards last year after earning Hulu the first Emmy for best drama series ever earned by a streaming platform. But Hulu still got a moment in the spotlight last night when Netflix tweeted about Killing Eve — a series produced by BBC America and streaming exclusively on Hulu. Eve’s lead Sandra Oh (also one of last night’s hosts) took home the award for best actress in a drama series, becoming the first woman of Asian descent to win more than one Golden Globe.